Forbidden City - Under the Ming Dynasty, the Forbidden City became the imperial palace of China. 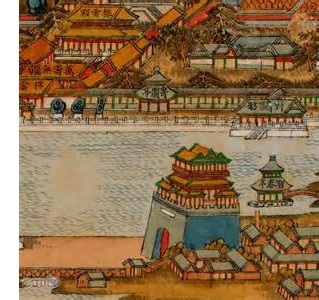 It solidified Beijing, which became the capital under the Yuan Dynasty, as the political center of China. Before the Yuan, the capital of China shifted between four different cities. Built between 1406 and 1420 by Zhu Di (the son of Emperor Hongwu, founder of the Ming), the Forbidden City would serve as the palace for nearly five centuries through the end of the Qing Dynasty. It consists of 980 buildings and covers 180 acres (or 72 hectares). In Chinese its pronounced Zijin Cheng which means "Purple Forbidden City". Purple refers to the North Star which in ancient China was called the "Purple" or "Emperor's Star" (perhaps because purple is the color of royalty?). Today it is a museum located just north of Tiananmen Square.